I was never in favour of sunscreen lotions. As important as they are my skin feels very oily and dull. I try and use face lotions which have some amount of SPF. Nevertheless, I picked this off the shelf as an impulse buy, in the hope that my search for the perfect sun screen lotion would end. 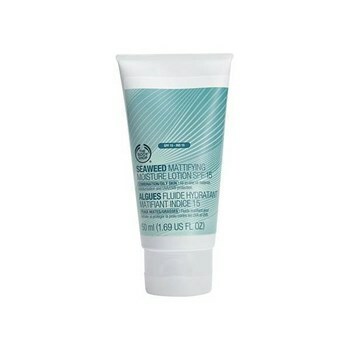 It is an easily absorbed non-clogging, oil-free, hydrating and cooling moisture lotion with a sun protection factor – 15. Packaging: The lotion comes in a small aqua blue plastic tube with a flip top cap. It is very innovatively designed as the stripes on the tube resemble a seaweed. The packaging is simple and effective. The cap shuts tight and you can easily travel with this tube with no fears of any product leakage. Pricing: The lotion is priced at 1295/- INR for 50 ml. I felt it was a bit steep but then all Body Shop products are.